A fine gentleman on instragram recently organized a mini quilt swap and I thought it would be fun to jump in. I was assigned a partner and commenced stalking her IG feed. She seemed to like subtle colors and beautiful, small scale floral prints. I had recently purchased a some pre-cut London of Liberty florals in a rainbow of colors, so I decided they would be my main fabrics. I decided on a plus quilt. There are so many great design options when laying out a plus quilt, and I spent a lot of time on Pinterest looking at inspiring quilts. 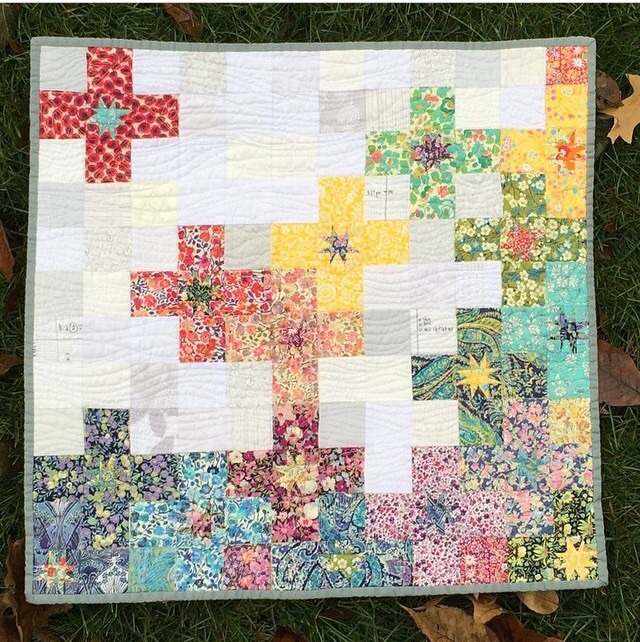 I ended up basing my layout on this gorgeous quilt by Megan of City Stitches. I used a variety of whites and greys for my background, since I had them on hand from another project. I wanted to add something a little special, so I decided to make teeny tiny wonky stars for the center of each plus. I tried to use contrasting colors to make each star, but sometimes they ended up blending in with the plus more than I intended. The stars were so small that sometimes the secondary colors in the prints came to the forefront, and the stars didn't stand out as much as I thought they would. It bothered me at first, but then I decided to embrace it as another design element. Some stars that pop out, and some that blend in. I had this quilted by Nikki Maroon and she did a beautiful job. The finished piece measures 24" square. It was fun to make this quilt and see my partner leaving comments about how much she loved it as I posted progress pics, since she didn't know it was intended for her. I didn't have to worry about whether she would like it. I already knew. I also really enjoyed picking out extras to send with her quilt. Paper Source is an excellent place to buy swap extras, it turns out. I didn't take a picture of those, but I think I sent some washi tape, a notebook, a candle, and some candy. I received a fabulous quilt from another IG user, which you can see here. All in all, a successful swap. I'll definitely do another when I have the time.